From time to time, historic places can find reinvention through adaptive reuse that extends their utility into new capacities. Greensboro’s Cultural Center is an excellent example of this “new wine in an old bottle” model of community conservation. Formerly the home of the Greensboro Daily News at 200 North Davie Street, the reincarnated building rivals the original in terms of form, function, and design as a cultural center. The Daily News was founded as a morning paper in 1909 but relocated to its namesake building at the corner of Davie and East Friendly in 1924. The three-story masonry structure was designed by one of Greensboro’s star-architects of the 1920s, Harry Barton. A highly-regarded designer, Barton’s most notable commissions include the Cone Export and Commission Building (Foundation Place), First Presbyterian Church (alongside New York architect Hobart Upjohn), Sedgefield County Club, the Sternberger Artists Center, Temple Emanuel (alongside Hobart Upjohn), the UNCG Auditorium, the UNCG Chancellor’s House, and the UNCG Quad. His most important work is often considered to be his service in leading the design committee charged with the construction of the c.1918 Guilford County Courthouse. 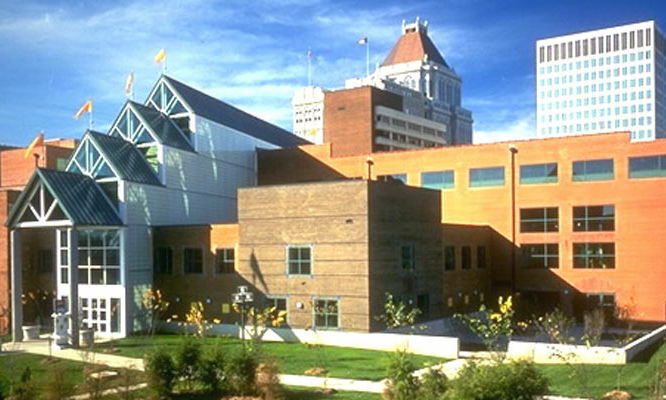 The 1985 adaptive reuse of the building was an important example of creative design in the state. When the Greensboro News Company moved into its spacious new campus at 200 East Market Street in 1976, plans were made to utilize the Daily News’ old building at 200 North Davie Street as the home of the United Arts Council, the Greensboro Visual Arts Center, and Green Hill Art Center. At a time when other communities were erecting new complexes for the arts, Greensboro took a different approach by preserving its architectural history and blending it with new construction. Greensboro was no stranger to adaptive reuse. Perhaps the city’s Scotch-Irish frugality or Quaker pragmatism led citizens to take a shine to reconditioned buildings, of which there are many early examples including the Greensboro Woman’s Club (adaptive reuse of the Weir-Jordan House in 1921), the Greensboro History Museum (adapted from the First Presbyterian Church in 1937), Blandwood Mansion (adaptively reused as the Keely Institute for 60 years before being restored as a museum in 1966), and Wafco Mill (adaptively reused as housing in 1984). As the home of the United Arts Council, the old Daily News building was reinvented as the community’s official cultural center of the arts. The $7 million multi-use project included galleries, office space, and practice space. It was designed by Cambridge Seven Associates (C7A), an important firm based in Boston – with local assistance by J. Hyatt Hammond Associates. The Cultural Arts Center is an early example of Post Modern Era Adaptive Reuse, contrasting older warm red brick walls with new green accents that include metal roofing, tinted windows, and muntins. Interior space was organized around a new dramatic atrium, among the largest in the city. In spite of the firm’s impressive rise nationally and internationally, the Greensboro project is highlighted as a representative example of their work more than 30 years after completion. 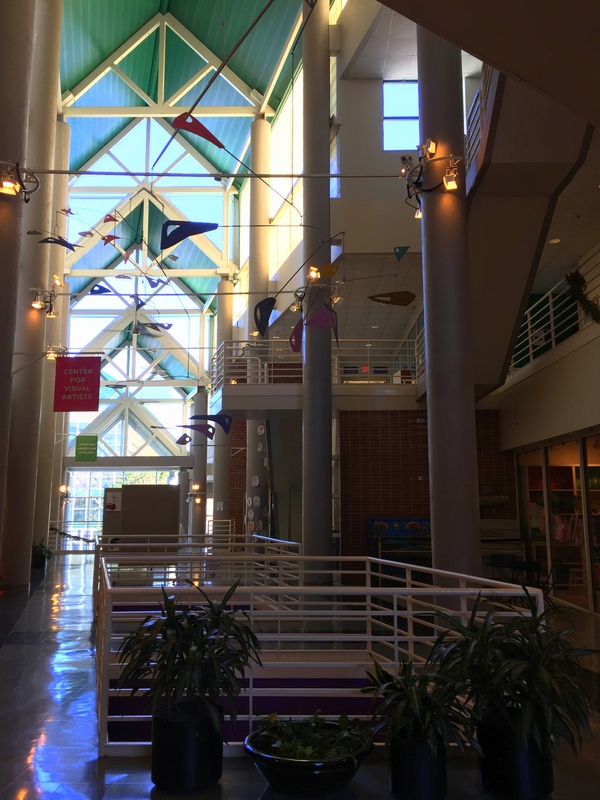 Contextually, Cambridge Seven Associates has few other projects in North Carolina, including the Greensboro Science Center and the NC Museum of History in Raleigh. Specifically, the Cultural Arts Center is connected to the firm’s principal architect Gary Johnson. The Cultural Arts Center is an important example of design that blends the work of two sophisticated architects. The original work of Harry Barton has been respected by the adaptive designs of C7A of Massachusetts, which remains fresh and relevant in 2017. A groundbreaking project when completed, it stands among the best examples of contextual architectural trends that emerged in the 1980s that incorporated previous craftsmanship and designs into elegent modern structures.